In of the recent updates on Visual Studio Online a very nice feature was introduced. Welcome pages. When you want to share some information about you project or other information with your team, what is the place to do that? When working on-premise you maybe have a SharePoint portal or a corporate blog, but when working with VSO there is not really a location that makes sense. This changes in the update of August 18 2014. Welcome pages are introduced and it is really easy to use! Welcome pages use the Markdown language to let you easily create some documentation for your team. You can find a nice post about this feature here. At first it will probably show nothing. This is because a .Readme.md file is needed in the root of you source control. 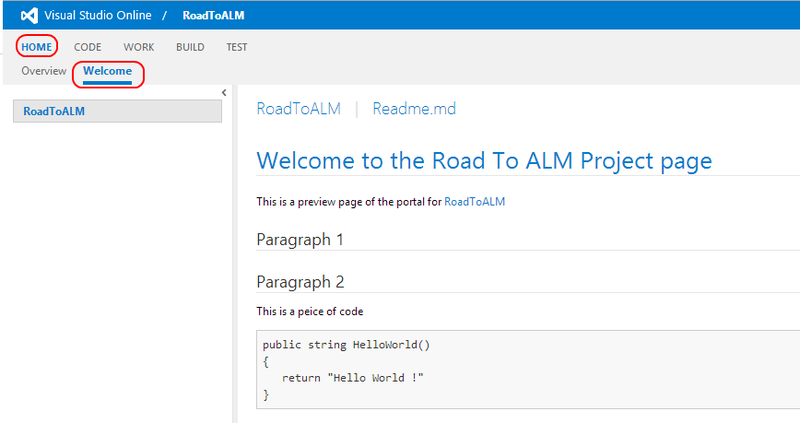 Create a Readme.md (for example using Markdownpad) and check this in to the root of your Team Project. Once there, you will see the home page appear. You can have more markdown files in your project so you can built up a whole tree of documentation! Currently there is no “nice” way to link link files relatively. In order to link to another file, just click the file on the welcome tab, and copy the last part of the url. Use this in your Markdown.